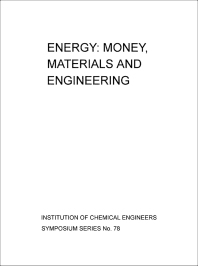 Energy: Money, Materials and Engineering focuses on the utilization and management of energy sources, taking into consideration the chemical processes and economic implications involved. Divided into eight parts with 47 chapters, the book features the literature of authors who have painstakingly conducted studies on the utilization, management, conversion, and the economics involved in the use of energy. These papers stress the contributions of chemical engineers and researchers in establishing the relationship of the development of energy sources, while at the same time minding their possible effects on the environment. In the conversion of energy, various processes are discussed. The book also touches the processes involved in the conservation of energy in various areas as well as in the industrial setting. Relative to this, various processes are discussed, including water electrolysis, the use of batteries in electricity supply system, coal gasification, and the use of turbines. The text also points out the evolution of hazardous materials because of the use of energy. The need to create programs to control their potential effects on the environment and health is stressed. The book is a valuable source of information for those involved in thermodynamics. 1. Thermodynamics and Economics — Is there a Conflict? 2. Thermodynamics and Economics — Is there a Conflict? 3. The Economic Containment and Application of Energy "The Chemical Engineer's Quest for Efficiency"
Theme 1: Thermodynamics & Economics — Is There a Conflict? 1. Is the "Value" of a Source of Energy based on Enthalpy, Entropy, Economy or Ecology? 2. Thermodynamic & Monetary Qualities, can they be Related?